Have you ever wondered if those amazing spy gadgets that you’ve seen in James Bond movies are real? Do operatives working for the Brit’s MI-6, the CIA, and the Russian SVR (formerly known as the KGB) really have access to sleek sports cars with ejecting passenger seats and wristwatches with hidden laser beam torches? My friend, H. Keith Melton, owns the largest collection of spy artifacts in the world – more than ten thousand items. Many of the 007 inspired spy gizmos on display at the International Spy Museum in Washington D.C. are on loan from his personal collection. Melton recently decided to show off some of his most prized items in a traveling exhibit called “Spy: The Secret World of Espionage” which opened in mid-May in Discovery Times Square in Manhattan. Featured in his traveling show is the trick umbrella that Bulgarian intelligence operatives used to shoot a pellet that contained ricin into the leg of Georgi Ivanov Markov, a dissident writer, while he was waiting for a bus in London. The so-called “deadliest poison” known to man was sealed by wax in a tiny pellet and was released when Markov’s body temperature melted the seal. The traveling collection also contains a CIA manufactured robotic dragonfly, the smallest operational submarine used in World War II, a robot catfish and pigeon made for spying and a pick axe that Soviet Ramon Mercader drove into the skull of Leon Trotsky in Coyoacan, a borough of Mexico City, in 1940. When he was preparing the exhibit, which will tour 10 cities during the next several years, Keith asked me if I would share some of the artifacts that I collected while doing research for my books, Family of Spies: Inside the John Walker Jr. Spy Ring; Confessions of a Spy: The Real Story of Aldrich Ames; and Comrade J: The Untold Secrets of Russia’s Master Spy in America After the End of the Cold War. What Mental Health Books Helped You? Each week, I receive books about mental illness from publishers who ask if I would be willing to give their book a plug. I also get requests from individuals who either want to get their books published or have self published their own books and need help publicizing them. This week I want to turn the tables. What books about mental health would you recommend? Is there a specific book that has helped you personally? 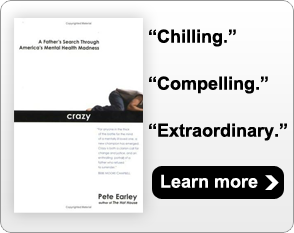 Have you written a book about mental health that you want to plug on my webpage? Here’s your chance. Don’t be shy. I’ll start. My friend, Clare Dickens, first published her book, A Dangerous Gift, in Iceland. It’s a moving story about her son’s struggle with bipolar disorder. When the big publishers in New York turned her down, she refused to give up. She kept knocking on doors. Recently, Politics and Prose, the Washington D.C. bookstore, published a U.S. version. I’m happy that she is telling her story here. Now tell me about books that helped or matter to you.